This is the first instance in Gujarat of a deputy CM in a BJP government, and a first from the Jain community as CM. Ending days of suspense union minister and observer for the Gujarat CM selection, Nitin Gadkari, announced Gujarat BJP chief and cabinet minister Vijay Rupani as the new chief minister and successor to Anandiben Patel, and Nitin Patel, another cabinet minister, as his deputy. In the delicate balancing act of castes and political factions, the BJP picked Rupani, a Jain, to lead Gujarat in the 2017 assembly elections and a Patidar as a deputy chief minister. This is the first instance in Gujarat of a deputy CM in a BJP government, and a first from the Jain community as CM. Rupani, cabinet minister for transport, water supply, labour and employment was picked by the BJP to head its Gujarat unit at a time when the party was tackling the Patidar quota agitation, and he is seen as close to BJP chief Amit Shah. The BJP under his charge, was seen as regaining lost ground, winning back constituencies in the by elections that were held subsequently. 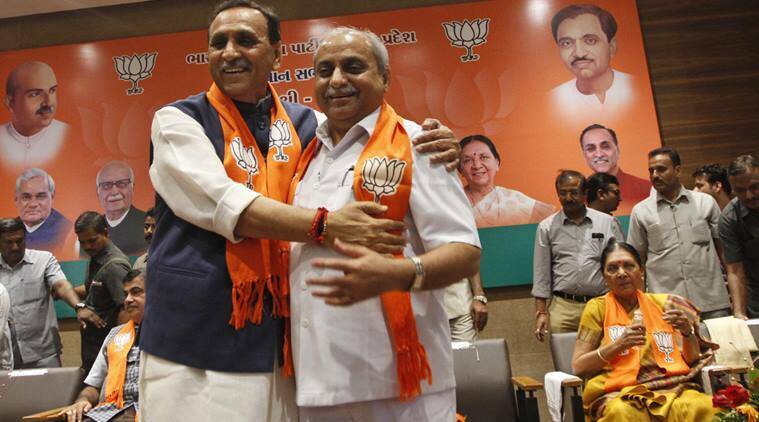 Rupani’s was the first name to do the rounds as the probable successor to Anandiben when she resigned on August 1. In fact, on his 61st birthday, on August 2, messages circulated about him getting a “special birthday gift”. The Bharatiya Janata Party, which was in power for long in Gujarat, has been facing tough challenges like Patel quota stir and Dalit unrest in the wake of widely condemned Una Dalit flogging incident aside from setbacks in rural areas in civic polls, which combined seem to have eroded its support base, prompting Anandiben Patel to resign.